Homemade cherry juice is a real boon for health. In addition to refreshing effect and its pleasant taste, it has a profound effect in the prevention of many diseases. Thanks to anthocyanins which slow the growth of cancer cells and stimulate insulin production by 50 percent. This healthy drink contains valuable coumarin and potassium. This mild-sour fruit which is dark red is rich in antioxidants that protect us from breast, lung, liver, and skin and colon cancer. If you are preparing a natural cherry syrup, know that it has a beneficial effect on heart health, and is recommended as a mandatory therapy for cardiovascular diseases. Learn how to make cherry juice and homemade syrup according to the recipe of our grandmothers, with and without cooking, which will undoubtedly remind you of a carefree and happier times. Burgundy and sweet and sour cherry is considered one of the favourite fruits. Originally from northern India and Iran, because of the numerous medicinal ingredients is widely used since ancient times. Today is mostly grown in Europe and the south-western part of Asia. Especially sough after is a home recipe for cherry juice without boiling, it simply enchants with its smell and taste, and it is an outstanding energy drink. It is recommended to all, especially to athletes for health of muscles, primarily due to its anti-inflammatory properties. This low-calorie foods is extremely rich in carbohydrates, glucose and fibre as well as vitamins A, E, C and folic acid. Sour cherries contain calories in small quantities, so in 100 grams of fresh fruit there is 41 kcal and even 43 percent of the required amount of vitamin C.
Also, within it there are phenols, galic and p-coumaric acid, kaempferol and quercetin. This food is rich in antioxidants such as lutein, zeaxanthin and beta-carotene, as well as anthocyanins. Natural juice from the cherries is a real treasure of potassium, magnesium and iron. It contains tartaric, malic and citric acid and refreshes the body. Many studies have shown us that a substantial amount of vitamin C and anthocyanins, and perillyl-alcohol, limonene and ellagic acid, protects against skin, breast, lung, liver and colon cancer. Exactly domestic juice cherry abounds in them, and should be regularly consumed. Researchers at the University of Michigan tested on laboratory mice effectiveness of these fruits. In fact, those who regularly consumed cherries, did not have cancer. Also, it has been shown that anthocyanins slow the growth of cancer cells. In addition, this powerful antioxidants stimulate insulin production by 50 percent. Therefore, the cherry is very useful for diabetics for it lowers blood sugar levels. Thanks to its high content of quercetin, the most powerful antioxidants that protect LDL cholesterol from oxidation, regular consumption of these foods reduces the risk of its accumulation in the inner walls of the arteries. In this way, sour-cherry juice prevents heart attacks and stroke. In a study published in the American Journal of Physiology states that extract of pitted cherries significantly improves the recovery of heart function after a heart attack. In addition it reduces the effects of free radicals. Homemade cherry juice made without sugar, significantly lowers the level of uric acid in the blood, and relieves pain in the joints, as well as the occurrence of gout, osteoarthritis and rheumatoid arthritis. Results of research conducted at the University of California showed that women who consumed 280 g of cherries daily, level of acid in the urine was reduced by 15 percent. Cherry is a rare type of fruit that contains melatonin - a natural hormone that regulates sleep, slows the aging process and regulate heart rhythm. Results of research conducted at the University of Pennsylvania and Rochester show that the persons who in the course of two weeks in the morning and evening drunk pure juice of cherries without sugar had significantly fewer problems with insomnia. These fruits have anti-inflammatory properties, relieve muscle pain, and homemade sour-cherry juice is recommended for athletes because it helps the body to recover faster due to strenuous exercise. This is shown in research conducted at the University of Vermont, which included 14 athletes that were divided into two groups. One group consumed twice a day 3.5 decilitres of pure cherry juice, while others drank a mix of other juices. The results showed that athletes who drank natural cherry juice with intense workouts felt much less fatigue and muscle pain than other groups of respondents. In addition, research conducted in Oregon in America has shown that this drink showed great results as part of the training regime before and during the marathon. The homemade cherry juice without preservatives contributes to faster recovery and eases sore muscles. Many studies have shown that cherry regulates metabolism and promotes the removal of toxins from the body. In addition, these foods melts the fat in the abdomen and are a good ally in the fight against obesity. 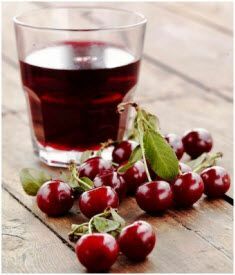 According to the results of research conducted on laboratory mice, sour-cherry juice reduces inflammation and reduces the risk of metabolic syndrome. Wash and remove the stems and seeds. Arrange cherries in a suitable container and sprinkle with limuntus, then add the water, mostly one liter. Then, the cherries have to be mashed. Thus prepared beverage needs to stand throughout the night covered with a cloth. The next day give it a good strain through an appropriate strainer, then through cheesecloth. Your homemade cherry juice now needs to be sweeten with sugar. The best ratio is 1: 1 but those who prefer sour taste and can reduce the measure. In the end, stir the resulting drink with a wooden spoon, until the sugar is completely dissolved. Pour it in the proper glass bottle and store in a cool place. The juice from the cherries without cooking and added preservatives is a much better option than the one bought in shops. If you have an old juicer you can make this famous recipe. This juicer in itself has a large pot containing the grid, where you must first insert cherries. The second container is filled with water and allowed to boil. At the end of the pot there is a tube from which the juice is poured out. Below lay a proper container for juice to leak, later pour in the appropriate bottle. To the drink you should add some preservatives, so you can use it for longer periods. It has an exceptional taste, but is not as healthy as the previous recipe, because the boiling destroys a lot of medicinal ingredients. One can skip a preservative, provided that you drink it immediately. Mash the banana with a fork in a mixing bowl, then add the cherries, cinnamon and orange juice, and whisk in a blender. Then insert the ground hazelnuts and pour the cooled milk, and mix until a uniform mixture is made. If necessary, add milk to get the desired consistency. How to prepare bread with cherries? Chop almonds in a blender and leave about 1/4 cup for sprinkling. To the rest, add the flour, baking powder, salt and blend it in a blender. In a separate bowl mixer whisk 3/4 cup of sugar and stir constantly while adding eggs one by one. Finally add the extracts and half a mixture of almonds and flour, and mix gently with a wooden spoon. Add remaining flour and mix well, then pour the mixture into a greased and flour sprinkled mould. From the above sort cherries, sprinkle the remaining almonds and a spoon of sugar. Bake in the preheated oven at 175 ° C for 70 minutes. Towards the end of bread covered with foil to cherries are not darkened. In a blender put the cherry and coconut milk and give it a good mix. Then add honey, vanilla extract and almonds, and mix well and place in the freezer to tighten. Enjoy. Put 3/4 cup of coconut flour in 2.5 dl of hot, but not boiling water and let sit for 2 hours. Then the mixture pour in a blender and mix well. Strain through cheesecloth, press well to squeeze as much liquid out as possible. To the milk you can add the vanilla extract and honey. Keep it in the fridge for a maximum of five days. Dear friends all these recipes are excellent, they take time but it is certainly worth a try. Our recommendation for you is definitely a homemade cherry juice without cooking. Enjoy this extraordinary fruit. Also, we recommend a recipe for healthy cherry syrup.